How did you choose your car number? The #2 has been in my family for decades. It was my fathers number and I picked it up from him. Divisions competed in:Go Karts for 11 years. Street Stocks for 4 years. 410 Sprints for 1 year. Dad got me a go-kart when I was about 5 years old. We tested it a couple times and I've been hooked since. Easily my father and grandfather. My father has taught me everything I have ever know about racing. I have grown up watching him since my first race when I was 2 weeks old. However, many people say I drive like my grandfather Peewee Flick, who passed away when I was 6 months old. Hating my life. But definitely playing hockey somewhere. The thrill of winning, speed, and photo finishes. My first ever stock car win. Passing 12 karts in 8 laps for a go-kart win. And some of the shows we were able to put on for the fans this first year in a sprint car. Just to name a few!! Blew 8 tires on the stock car in 2011. Just horrible, horrible luck. Blew a brand new tire before even taking the green flag. Incredible. By far exceeded my personal expectations. We, as a team, learned a ton. I cant wait for 2015. 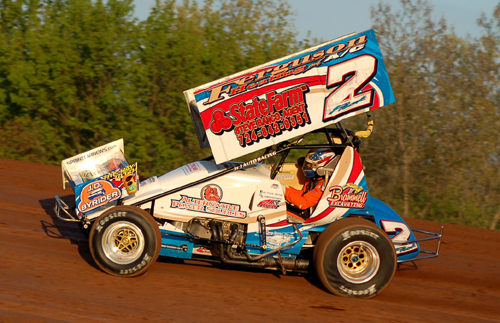 Run for points at Mercer and Lernerville. As well as trying to hit some bigger races in the area, specifically with the Renegade Sprint Series. This will all be dependent on the job I can find after I graduate in May. Hopefully better than it is now. I like what some people are doing to make the division better. But then others are doing quite the opposite. The cost of these cars are so expensive that we need the competition between series in order to drive purses up and help cover the expenses.